The objectives of the Biosatellite, a.k.a. Biosat, Bios (Biological Satellite), were to determine the biological effects of the space environment upon daily rhythms of living organisms and to obtain and analyze available data on the performance in orbit of life support, altitude control, and other spacecraft systems, including instrumentation for recording biological data. Biosatellite 1 (A) carried biological specimens to determine the effects of the space environment on life processes. 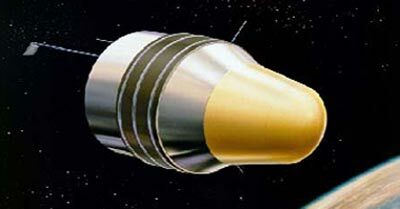 The reentry vehicle separated but the rocket failed, leaving the capsule in orbit. No useful scientific data was obtained. Biosatellite 2 (B) carried 13 experiments to conduct biological experiments in low earth orbit. Reentry was initiated 17 orbits early because of communications difficulties and a storm in the recovery area. Biosatellite 3 (D) was flown to conduct intensive experiments to evaluate the effects of weightlessness with a pigtail monkey on board. The spacecraft deorbited after 9 days because the monkey's metabolic condition was deteriorating rapidly. The monkey expired 8 hours after the spacecraft recovery, presumably from a massive heart attack brought on by dehydration. Biosat C, E and F were cancelled after the very limited results of the first three missions.